The Miami-area teen said he's been cutting hair for 2 years, but just realized he has an "ability to help others in a way that I know best." 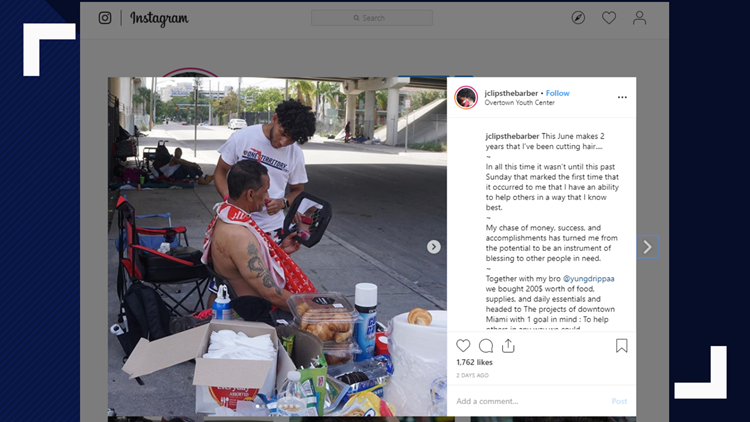 MIAMI — A high school student in Miami said he's been cutting hair for two years now, but only recently realized how that skill could give back to his community. WSVN reports Joshua Rodriguez, 18, aimed to give back to the less fortunate in the Overtown neighborhood last weekend. "In all this time it wasn't until this past Sunday that marked the first time that it occurred to me that I have an ability to help others in a way that I know best," Rodriguez wrote on Instagram. Together with a friend, the two said they bought $200 worth of food and daily essentials with one goal in mind: "to help others in any way we could." Photos posted to Instagram and Twitter show the two set up tables of snacks, drinks and utensils under an overpass. Other photos show the duo's skills with barber clippers. Rodriguez said they spent hours giving out food and free haircuts, but "the smiles we caused and happiness we saw made it the best $200 we ever spent."